Let’s first just get this out of the way right now: Self-care is not laziness, or just “treating yourself.” It’s not an excuse to get out of going to a party, or something you do when you don’t feel like going to work. Self-care is extremely important to maintaining a happy, healthy body and mind. We need to stop feeling guilty for taking care of ourselves. If you’re too tired to go out with friends, stay in! If your period is so bad that it’s preventing you from going to work (been there) then call in sick. No matter what your specific reason is, I can’t express how important it is to listen to your body and to practice self-care. Our bodies are intuitive, telling us when we need rest, or when something just doesn’t feel right. But we’re all so immersed in this go, go, go society that we ignore these silent sirens. We compare ourselves constantly to others on social media, which oftentimes results in a lack of self-confidence and even depression. When we don’t listen to these warnings, it doesn’t only affect our mental health, but our physical health as a whole. I did this for years — ignoring the signs that I was exhausted and needed a mental health break from work. Pushing myself when I was sick and should have been resting. Ignoring symptoms of an anxiety attack and telling myself I was just overreacting. When I finally realized the harm I was doing to my body — mentally and physically — I decided to take action. 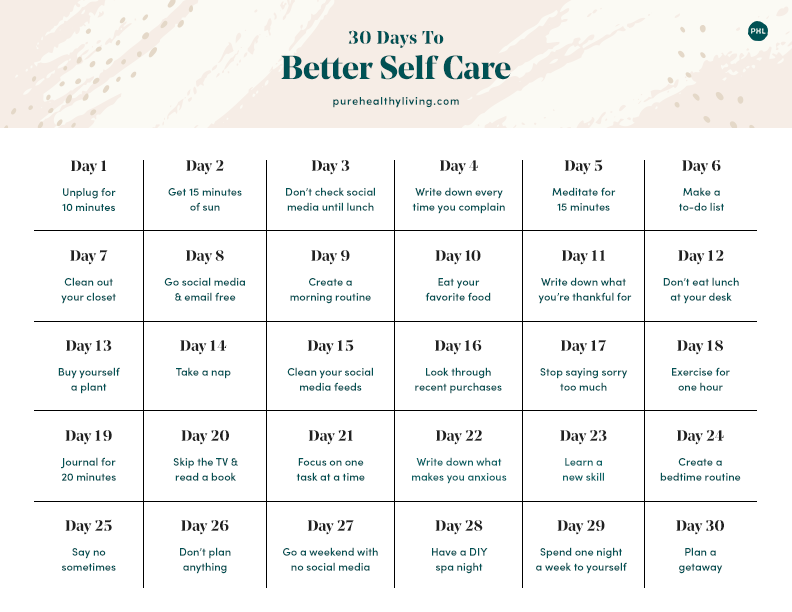 These are some of the things I did (and still do), to get in the habit of better self-care. They’re broken down day by day to ease you into it so that by the end, you’re already feeling happier and healthier. We start out easy and build you up, so you’re not jumping right into anything! Try them out to see what’s best for you. Or, if you’re feeling inspired to come up with something on your own, try that out. What’s your self-care routine? Share it with us! How do you take care of yourself physically, emotionally, and mentally? Go through your morning without checking your social media feeds, and you’ll notice you’ll have a lot more time to get ready in the morning and get ready for your day! Complaining brings us down and drains us mentally and emotionally — write down every time you complain to make yourself aware of what you’re saying. This will help you think about it more as you go forward. Put aside 15 minutes during your lunch break, after work, or right before bed to meditate. You can use free apps like Simple Habit to walk you through it. Crossing off to-do lists is one of the most satisfying feelings ever. This will help you keep organized and feel accomplished at the end of the day! ﻿Again, feeling organized goes a long way! Clean out your clothes and donate things you haven’t worn in a year. ﻿Take one day to not check social media or your email for a whole day. ﻿Identify what you need to do in the morning and stick to it! Having a routine will help you start your day feeling organized, which you can carry throughout the day. The actual definition of treating yourself. Even if you’re watching what you eat or trying to be healthier, it’s OK to indulge in the foods that make you happy! In the business of life, we often times forget everything we’re thankful for in our lives. Write it down. Actually take a lunch break and disconnect from your office for half an hour. Take your lunch to a local cafe, or eat it outside if it’s nice out. Plants and flowers automatically freshen and brighten up a room. Buy a bouquet or if you’re looking for something long-term, a plant for your desk or living space. You’re two weeks into this, take a nap! No alarms, no distractions. See what you’re buying and what you can cut back on. Financial stress leaks into all parts of our lives — if you can find ways to minimize that, you’ll find yourself feeling much less stressed. We all apologize for way too much. If you responded to a text late, don’t say sorry! If you’re venting to someone about work, don’t apologize! Do whatever you like to get your heart going. Exercising releases natural endorphins that make us happy! Write down what you did today, what you have planned, or what’s bothering you. Keep a journal that’s specific to writing these thoughts down. Pick up the book that’s been on your nightstand for weeks and finally start reading it. You’ll find yourself imagining your own world as opposed to watching a screen. Quit multitasking and take things one at a time. This will help you focus and feel more accomplished, as opposed to feeling flustered and anxious. ﻿Identifying triggers and themes of things that make you upset or anxious is step one to eliminating them for good. If there are things that you can eliminate, take steps to do that! ﻿Stop putting off something that you’ve been wanting to try, and do it! Sign up for a class, or start a self-teaching routine. ﻿Whether it’s reading, meditating, or watching a favorite show, find a bedtime routine that genuinely relaxes you. Stay off of social media! ﻿You can’t say yes to everything. Today, say no to one task, event, or something else in your life and give yourself a break. ﻿Wake up feeling refreshed without the pressure of having to make it to an event or gathering. Go with the flow, and breathe! We all need a break, a real break, from social media and email. Enjoy your weekend without worrying about work or checking in to see what all of your friends are doing and focus on yourself. Whether it’s a face mask, a bath, a pedicure, or something else, do something to pamper yourself. ﻿No dinner plans, no events, no work. Choose one night of the week that’s dedicated just to you. You can change week to week, but just give yourself one night to unplug, relax, and focus on doing things for yourself. From going to visit a friend or going somewhere you’ve been dying to go, plan it. Create a savings plan if need be to give you something to look forward to. Getting away from everyday life and taking a vacation will make you feel relaxed and refreshed. The point of this isn’t to continue to do all of these things — it’s to identify what makes you feel good in hopes that you’ll continue a few! Spa nights aren’t for everyone, and you may already have a morning routine. We just want to inspire you to become a happier, healthier you.